This is the time of year, when it's cooler, to celebrate the New Year...the High Holidays are happening. Unlike the secular New Year, on the Jewish New Year, there's a lot of time spent in reflection and with your family. The reflection focuses on how you've done as a person this past year--whether you've hit the mark, or "missed the mark"--like in archery. The mark might mean: being a good person, a good partner, a good friend--a good member of society. A person who does what they are supposed to do...the "mark" is different for each person, each year. A sentence for thinking about this was offered to me this year: I am proud of this accomplishment... and I hope to accomplish this ....next year. Implied in this is--we did some things well. There are other things we need to do better. For me, I find this thoughtfulness every year useful...sort of an ancient formula for goal setting. My friend Kate accomplished something monumental this week--she had her third baby! Although I couldn't make it to Boston to celebrate with her family, I did manage to make a big sister sweater. This is made out of a tape yarn that is machine washable, and it just so happens that my friend's two older girls are roughly the same size this year. 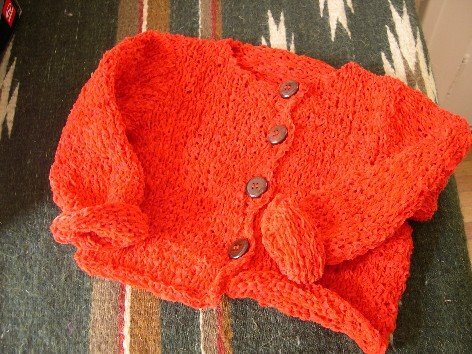 Here's one big sister sweater for both of them to share...it's in the mail. To give you an idea of this sweater's size? 24 inch chest-- Big sisters are so small sometimes! 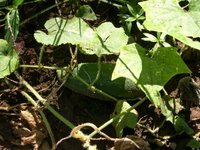 Our garden is beginning to wind down, but we're still getting a few cukes a week, beans, basil, and other goodies. The Jerusalem Artichoke flowers are out, and the sunflower is beginning to droop. It's feeling like fall. 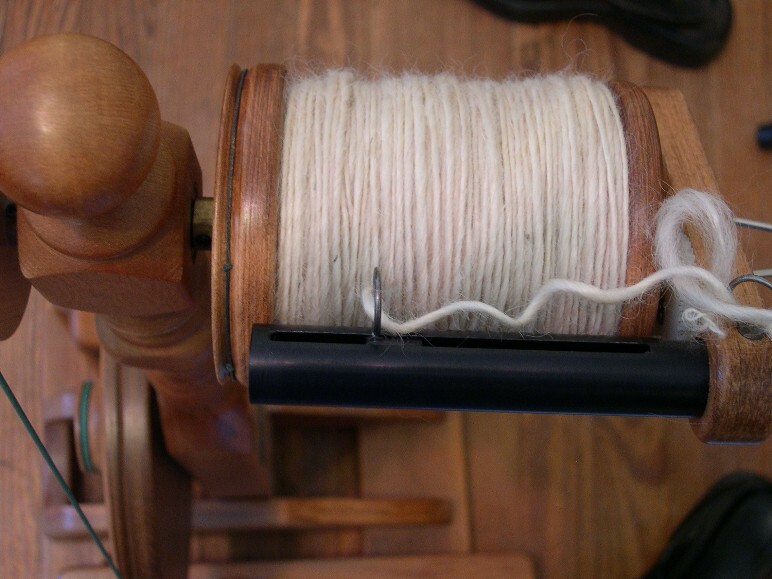 I've returned from my spinning hiatus with a vengeance. 8 skeins of Cotswold/silk are now waiting for me to set twist, add mordant, and pop them into the dyepot. I see garnet and marigold yellow in their future. adopting Sally last November. She has learned so much this year. She's gone from being a scared girl who hid under a car at the animal shelter, a dog who wasn't housetrained and didn't understand leashes, to being a real model bird dog. She's quick-witted, bright, and cautious. She barks at the door, sits at street corners, and takes care of business--outside. Most importantly, she knows she's safe, and loved. Harry the dog really needed his own pet! Harry loves Sally so much that he taught her about leashes himself by leading her around the house with the leash in his mouth. What do I wish for the new year, 5767? I want to build stronger relationships with family and friends. These bonds can be strained by distances and differences, and I'd like to do better at maintaining ties to new friends, and old. Whatever your faith, have a happy, healthy, productive and full year. Happy New Year, Ramadan Mubarak, and Enjoy Autumn! Here are the photos that should have accompanied that last post. This same fleece is now dyed in three colors--Navy blue, Reseda (Dark) Green and multi-colored "Mermaid" Greens and is drying in said basement, along with the Border Cheviot and the mixed breed multi-toned black to caramel colored fleece. One last caramel colored Cotswold fleece to be washed! First, thanks to all of you who emailed me or left a comment. I'm grateful. As many of you know, I work alone and sometimes am desperate for social contact...your notes are meaningful to me, even if I don't email back each time. Actually, from the last set of comments, I read about Iranian weddings, Cormo, pickles, and Harry's possible contagion, so I've learned a lot! Thank you! On the dog front, Harry's had antibiotics and is better. Sally just had to be wormed. Yup, it's an ongoing struggle here...I think I'm helping the vet buy a boat, but it's worth it. I love my guys! On the human front, we've loved the cool fall weather and are being punished for it by bad allergies. Also, I suspect that until the end of the fall semester, and possibly until May, I'll be spending a lot of time propping up one exhausted and stressed professor. Last Thursday, I took him away from all that. 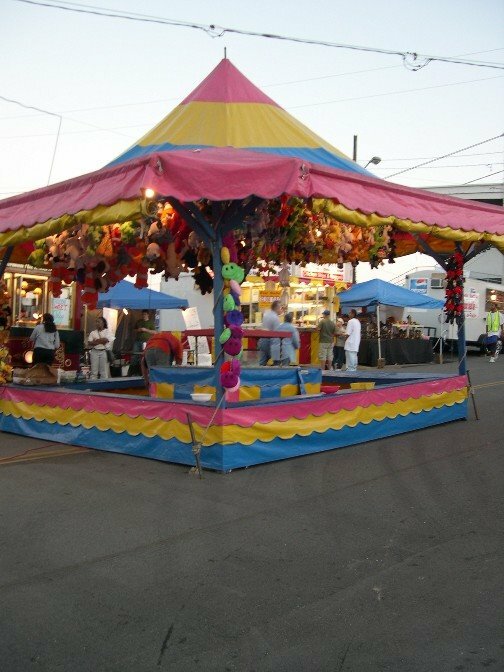 We went to the fair. We cruised by the midway and we didn't even stop for funnel cake. We were good--we went out to a Pan-Asian food cafeteria in Nashville first, so I wasn't even tempted by junk food. Apparently the professor was, but I pulled him onward...to the sheep barn. 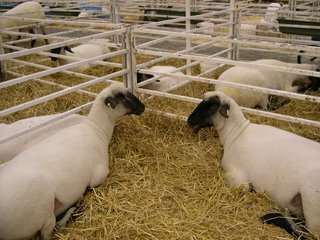 We saw meat sheep competitions, visited with a few very clean and friendly penned sheep, and then went to the spinning competition and the fleece auction. 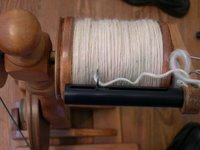 The spinning competition is a friendly "who can spin the longest single ply in 10 minutes" thing, on spinning wheels and on the drop spindle. There are categories for beginners and for everyone else. In the past, I've actually won first place at this competition! This year I won two second place ribbons. I had a great time and I won 4 oz of some lovely Chasing Rainbows Dyeworks fiber in a rich brown colorway called Mendocino Hedges. 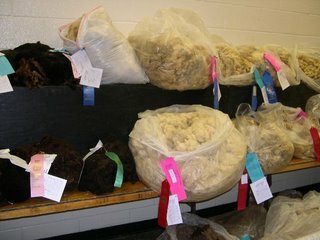 Then, the fleece auction happened--it's called an auction, but honestly, the fleeces are so numerous that there are few spinners who bid against one another. Mostly, you choose low-cost, gorgeous raw fleeces with ribbons on them, write checks to the shepherds, and go home happy. 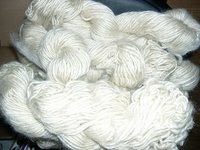 This year, I bought 4 fleeces: 1 border Cheviot, 1 lovely mixed breed fine wool with a long staple with colors from almost black to caramel, and 2 cotswolds--one white and one moorit. I spent $40. Now, bear in mind that with dinner out in Nashville, gas, fair admission fees, etc. the whole evening probably cost us $100. OK, now subtract $20, because I won that much in the spinning competitions. (assuming, of course, that the state of Tennessee cuts me a check and mails it to me!) So, that's $80, plus some lovely hand-dyed roving that I won as well. At basically double the cost of the fleece, I still think it was a steal. A really fun evening for the two of us, several hours away from university stress and lecture courses--Priceless! 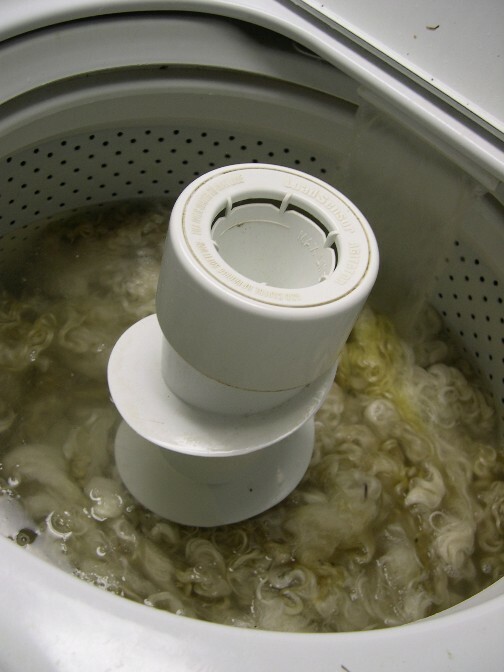 Three of the fleeces have already been through one washing, but even with hot water, and the addition of borax and vinegar, I can't seem to really get them clean. The water here, so rich with minerals from our limestone caves, makes fleece cleaning difficult, which is something I've never had problems with before moving here. 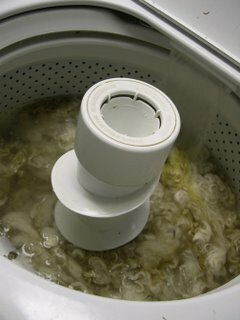 I'm considering adding some hot soapy water to the dyepot, and hoping that with a long simmer, they will come clean then...or a trip to my favorite wool processor mill to try again. I've tried to post photos with this entry but for some reason, Blogger isn't allowing me. 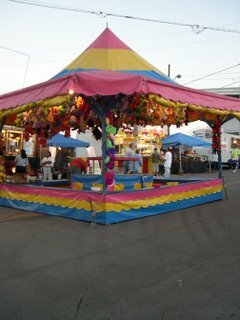 I will try again later, but for now, I hope you can use your imagination to enjoy the fair experience with us! This is an everyday, at home sort of story. We went to New Jersey for my brother-in-law's engagement party. Hurray! Ok, I have to admit, before marrying into a NYC family, I'd never heard of an engagement party. Weddings, yes. Rehearsal dinner, of course. Wedding showers, absolutely. Even the odd bachelor/ette party. However, those Yankees enjoy a party to celebrate the engagement, too. They wanted to tell me, no, this is a normal thing, everyone does it, everywhere. I said, uhh, not among us Southern Jews...anyhow, now I'm part of the family, I go to some of the parties. They even threw one for me. Who knew? Anyhow, before the big event, we had a chance to go to the Morristown Farmer's Market, which was really fun. We bought flowers for the family member throwing the party, hard sheep's cheese that could travel in the suitcase, and ....pickles. A 3/4 sour pickle for each of us. It came on a stick, so we could walk around. 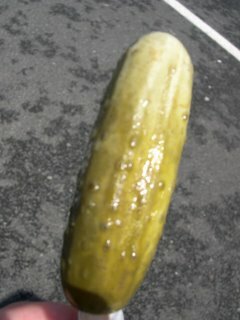 It was yummy, and I'd never had a pickle on a stick before! If you're in that area of the world, I recommend Picklelicious. Since I don't live near this pickle mecca, I made my own sour dills this week from the garden cukes. They're pretty good--but nothing like as good as Guss'_Pickles, my husband's all-time favorite. When we got home, we discovered that Harry didn't feel so good. 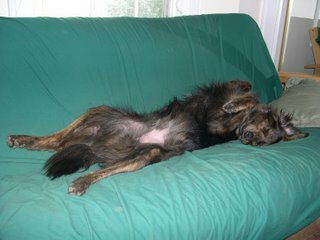 "Cough, Cough, Mom, rub my belly..." so now the guy is on doggy antibiotics. 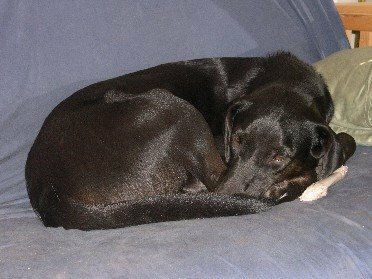 Apparently doggy antibiotics didn't agree with him this morning, so uhh, now I've had to clean up the dining room rug yet again. Why does everyone get sick on that rug? I'm beginning to think, you know, maybe I don't need a rug there. Hardwood floors? Just fine without the rug? I'm thinking. The rug is drying. In its stead? 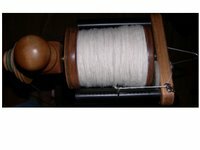 A worsted weight Cotswold and Silk single ply. I finished this in an hour. No kidding!! I also spun another bobbin the next day. I'm working on one a day, I think. Amazing how a bit of cool weather and a change can make all the difference! Please, leave me a comment. Tell me about your favorite pickle. Your coughing pet? Your proposal thingee? Or handspun adventures? I know you're out there. I hear some of you are even reading regularly...but how would I know?! Well, that last post was a doozy, huh? A little long? 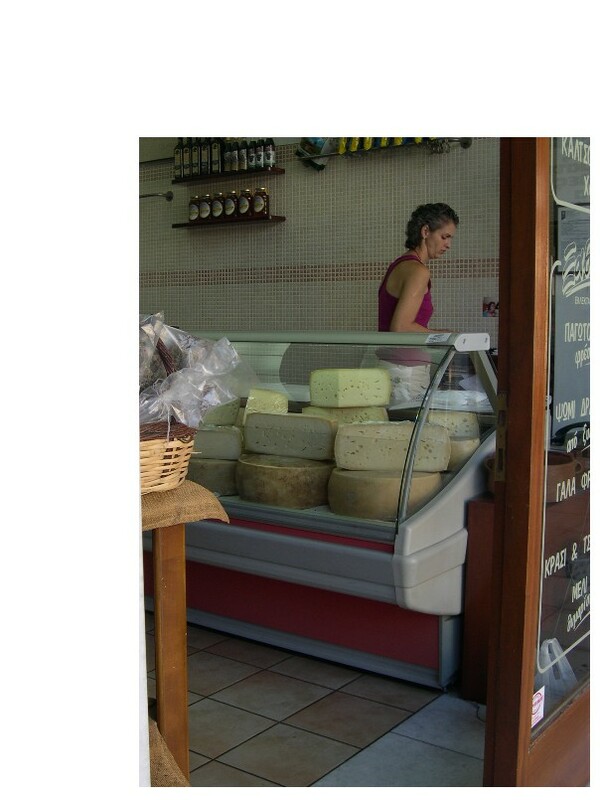 Just after posting it, I thought of a couple of other things you might enjoy about Crete. I know, you're thinking, when will she get back to dogs and knitting? A little gardening? Canning? Will she shut up already? 1) The photos are not labelled, the first few are from a trip to Ireland last fall, and there are a lot of butterflies to look at. 2) It may take you a while to download the images, and maybe too long if you are a dial-up person. I'd advise getting a snack, reading my old blog entries, or maybe taking a mile long walk with your favorite dog(s) or people. 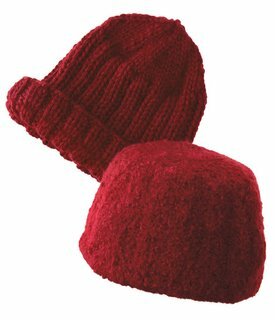 Now, back to my regularly scheduled programming: While I was gone, the rights for my Knit Picks design, the I'll Pack a Hat, reverted to me. It is now available on my website as a pdf downloadable pattern. So, if you want to make a warm hat for winter, I'd be honored if you'd consider making this pattern! It's now available here. 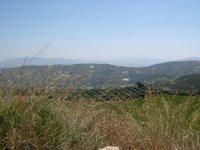 Gonia, the local Greek Orthodox Monastery. 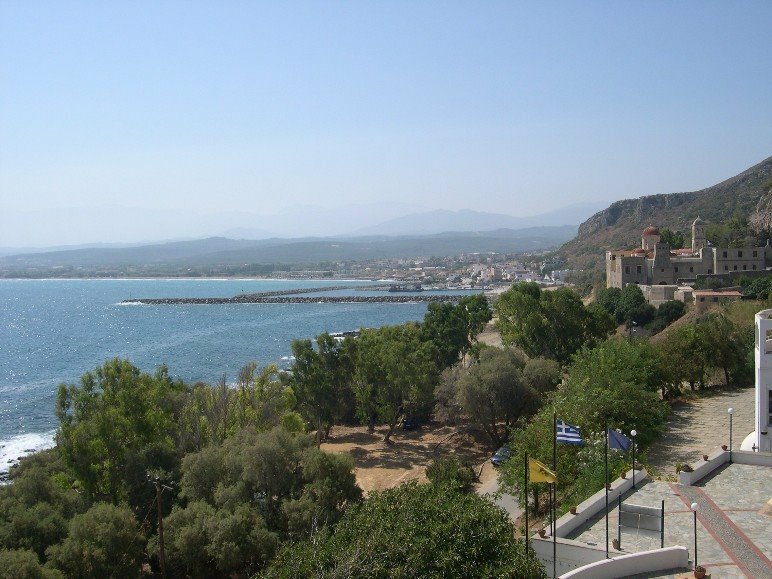 (scroll down when you check out this link, Gonia is described about halfway down the page) Most of the people in Crete are Greek Orthodox, and from the conference center, you could hear the monks chanting and smell incense, on occasion. Gonia fought off the Turk invaders and has a fascinating collection of icons, handmade vestments and Byzantine artifacts. These include legal documents written in Turkish (when Turkish used Arabic script) and even Greek documents in which the calligraphic handwriting looked remarkably Arabic in influence. The mosque built by the Turks still dots the horizon in Chania; many religions meet in Crete. History books often pretend that long ago, the Greek and Roman, Arab and Western worlds were separate places with a lot of isolation; this is just not right or subtle enough, in some ways, we've had a global religious society forever. I wish I could show you photos of the things I saw at Greek Orthodox places, but photographs aren't allowed in these holy places and of course, I respected that. 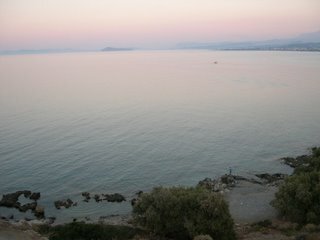 The last day of the conference arrived and we went back to Chania for our last night in Crete. We took advantage of the extra time to eat gelato, wander the streets near the harbour, and eat a meal in a restaurant called "Steki" (The Haunt) which is housed in a ruin. 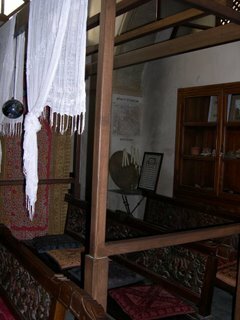 The synagogue was immediately looted and taken over by squatters. Over the years, there were stray animals, a chicken coop and dumps on the site of this congregation. 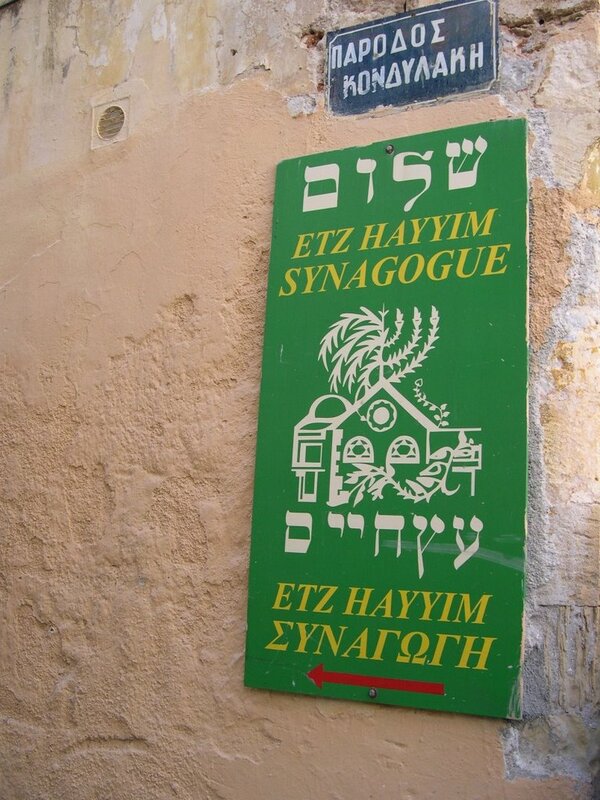 In the mid to late '90's, an international and local inter-faith effort was made to restore the synagogue, because without this restoration, the Nazis would have succeeded--erasing thousands of years of Jewish ritual and culture. extraordinary place. However, Etz Hayyim (this means "Tree of Life" in English) is a remarkable place, complete with a website that's worth exploring. There are now daily prayers again with mixed seating, and it's a peaceful sanctuary, sheltered in a verdant courtyard. There's an old alcove in the wall for ritual handwashing. There is a library filled with books on religion, in many languages, in an area that used to be one of the women's sections. There is a restored mikveh, a ritual bath, that was so inviting that I wanted to use it....Apparently it is still used by brides and there is room there for a traditional Middle Eastern Henna party for the bride, which used to be usual in Crete. Generally, Jews bury their dead in cemeteries away from places of worship, but during a time of political unrest, several very esteemed rabbis were buried in one of the courtyards within the walls of the congregation. The date of the earliest seems to be 1710, and we were able to visit this grave, too. 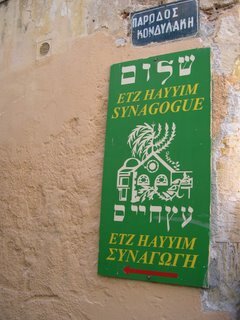 There are very few Jews in Crete now. The area around the synagogue was, at times, a ghetto where Jews were forced to live, but while the old buildings still remain, there are no traces of that civilization left. 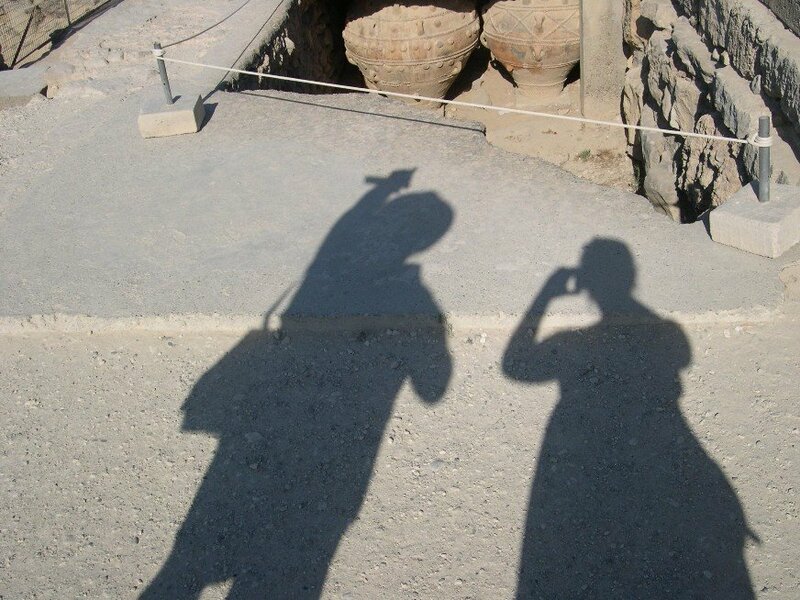 Our last Chania encounter was equally meaningful. I met a German woman, Anja, who married into an old Greek weaving family. 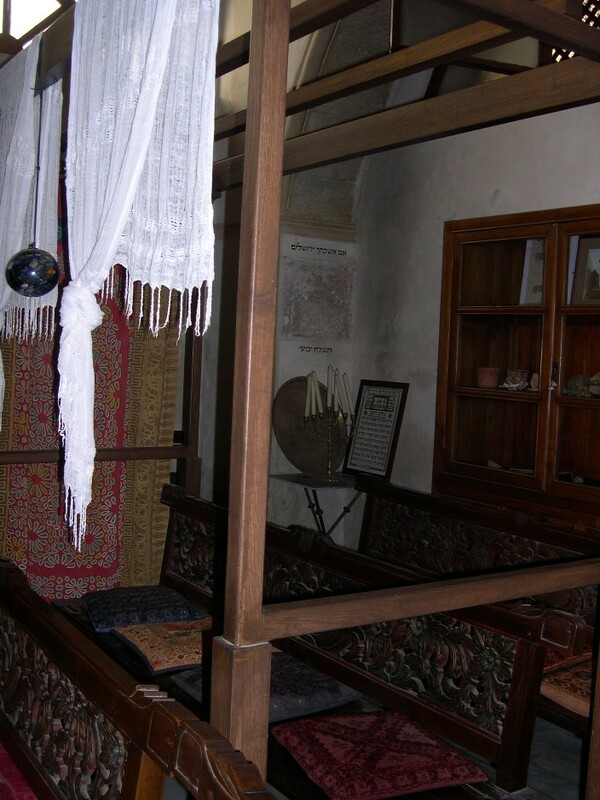 The family has a shop called Roka Carpets, which has been housed for generations in an old Venetian town house. 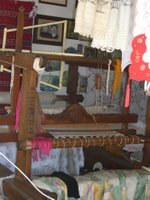 This family is one of the last in Crete to maintain Cretan weaving traditions. Their wool comes from the extended family's sheep, handspun on drop spindles, hand-dyed by the family. There were 3 or 4 looms in the shop, and many kilims and carpets. They are now struggling to make ends meet in an age of mass-produced textiles. They make weavings to order, and I have their contact information for anyone who'd like to know more. In the front of the shop, a large embroidered art curtain, a parochet, hung. Anja embroidered this curtain for Etz Hayyim for use on the high holidays and it took her 7 months. It's a fabulous job, filled with19th century traditional Jewish ornaments like peacocks, lions, a menorah, and a biblical quote. This was all done in Hebrew that Anja had checked by a rabbi in Tel Aviv for accuracy. This fabulous piece of handiwork also shows the rich interdependence of a small, ancient diverse community. 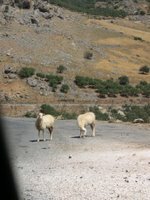 While tourism keeps Crete alive, the old traditions are struggling, and both the Jewish community of Crete and Roka Carpets are struggling to stay afloat in the current global economy. I was really touched, enriched, and affected by this trip. In many ways, it helped reinforce much of the history I studied in college and in graduate school. I saw interfaith and intercultural dialogue in a tangible way that is hard to gather from graduate seminars and old microfilm. Yes, I'd studied much of these historical occupations and cultural exchanges, but in Crete, you can see it in the people, in the landscape and buildings, and in the daily custom. This is a Greek Orthodox environment where one can eat a meal in an old Turkish Hamam, look at Christian art influenced by Islam, and see Jewish traditions, distinct and yet influenced by the Muslim and Christian environment around them. I was sad to leave Crete and come home, but the long airplane journey (over 20 hours) reminded me how far away Kentucky is from Crete. The security wasn't onerous at all, and oddly, the most comforting thing I packed for the journey was the Boucle Wrap that I just posted a free pattern for on my website. It was the perfect lightweight, warm throw for an 11 hour flight across the ocean. You can never tell when something warm and knitted will come in handy. 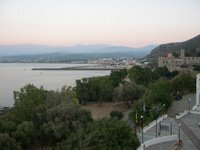 I wasn't sure anyone was reading, but I've been told that lots of you are travelling to Crete here by way of the travelogue, so I'll share my last few days of photos. Thanks for reassuring me with a comment or two--we all know how tiresome other people's holiday photos can be sometimes! This is the beach right below the conference center. It's a rocky beach, but that didn't stop many people from enjoying it. The locals brought their infants to the rock pools, right at the water's edge, because the water was clear and shallow. The surf fishermen fished out on the rocks to the right. The brave conference goers (I was not one of them) swam out far beyond the rocks into the sea. Kolymbari's beach, a kilometer down the road, was a "Pebble beach" --basically stones. It looks a lot like some of the beaches in the south of France, for comparison point. I saved myself the (short) walk and sunbathed in the mornings down near the rocks, and dunked myself in the shallow tidal pool to get cool. I didn't get much exercise doing this, but then, I also did not scrape myself up against the larger rocks farther out. There are many beautiful sand beaches in Crete, like Paleohora or Matala, as I mentioned earlier...but the rocky shores were just as striking. 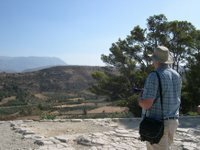 European conferences often have an excursion built in as part of the event, and ours was to Paleohora. It was lovely swimming in the Libyan sea, fun seaside shopping (two pairs of gauzy cotton pants for me, at 14 Euro each) and a sort of touristy meal with Greek tourist music and dancing. This was the only low quality meal I had during my whole stay...but they were serving 140 people at once. Every meal had lots of fresh and tasty fruits and vegetables. Salad accompanied every meal, with fruit for dessert. I promised to shoot lots of photos of food, but when you're eating at a long family-style table at a conference, it's hard to shoot photos inconspicuously. 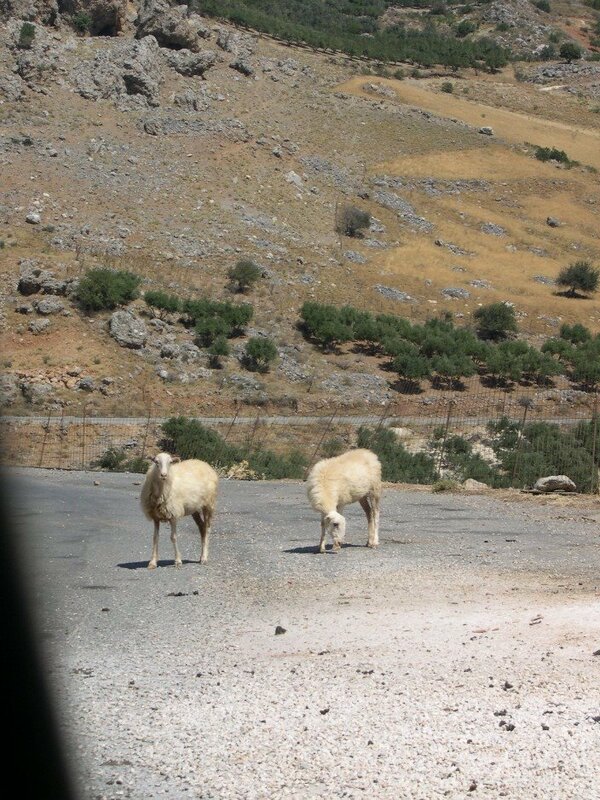 So, some suggestions for those travelling to Crete: The lamb is good. The octopus is good. Salata. Order that! There are all sorts of salads, and lots of luscious fruits, ripe off the trees. (I ate fresh figs and pears straight off the trees, and grapes were everywhere.) Order bottles of wine and ask the waiter for his suggestions. The house wine in the smaller carafe amounts isn't very good. Last suggestion: Read a Greek cookbook before you go, and learn the names of the foods (and the ingredients in them) that you'll like. It helped me enormously, because it appears that when we were at restaurants, the wait staff looked to me when it came to ordering. Apparently I look Greek, and the lady of the family orders for her spouse. Husband didn't complain once, I think I did ok. 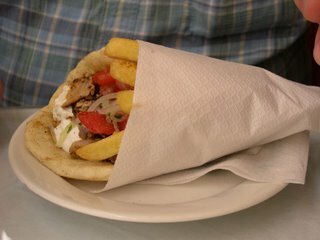 I'll leave you with a photo of a gyro we got on the street in Rethimnon. This cost 2 Euro. We each ate one, it was a complete (and delicious) meal. It's kind of like what you can get in the USA, but it tasted better...street food always does. Festos (or Phaistos) is a Minoan city or palace. It is the second largest in Crete, after Knossos. 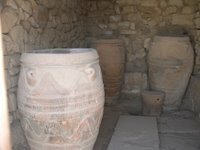 We didn't go to Knossos, and we really just went to Festos when we realized we were driving by it on the way to the conference that we were really in Crete for the husband to attend. The funny thing is that once we arrived, the husband started spouting loads of information about the archaeological digs. There is just no telling what is in that brain of his... It's always such a surprise! We didn't do any formal tour. We didn't even read the brochure carefully. Instead, we admired the layout and remains of what was obviously a luxurious place to live, a long time ago. Between the husband's archaeological information and my Near Eastern studies degree (heck, I remembered something from all those required courses as an undergraduate) we had a very lighthearted self-guided tour. The view, above, is probably very close to what it used to be, and it is amazing. Also, there are these huge storage rooms, filled with Amphorae. These are not the best looking ones, the best Minoan small finds ended up in the museum in Iraklion, a city in Crete. Even so, they were impressive. We hopped back into the car and drove across Crete towards the conference, held at the Orthodox Academy of Crete. On the way, I did happen to pick up some more yarn in Rethimnon, along with some very yummy gyros for only 2 Euro each! More on that another time...now, on to the big butterfly genetics conference. Here is part of the view from our room at the Academy. I could see this (and more) from our balcony. During this week long conference, I slept, read, knit, sunbathed on a rocky beach, and talked to bright and interesting scientists from all over the world. France, Scotland, New Zealand, Iran, India, Japan, China...those butterfly people come from all over, and they were fascinating. Oh, and I ate. The food was very good. More tomorrow! 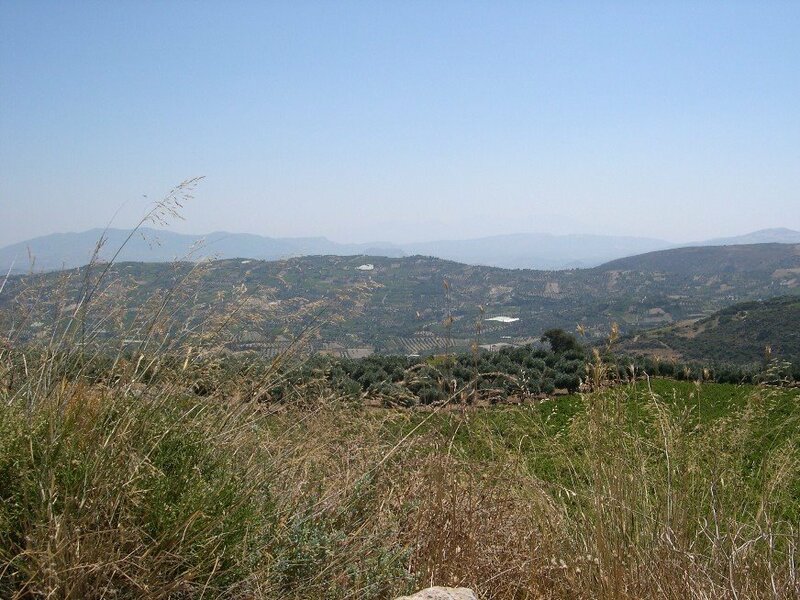 Some of the hillsides were green with olive and fruit trees, and many were brown. The mountains did not grow trees at the tops, they were taller than one would think. 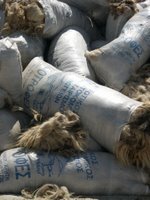 Anogia is also the center of the shepherd industry in Crete, we ate lamb for lunch and we saw these fleeces by the side of the road. I got close. They were felted, dirty, and looked mainly like hair. The wool didn't match up with the sheep I'd seen. 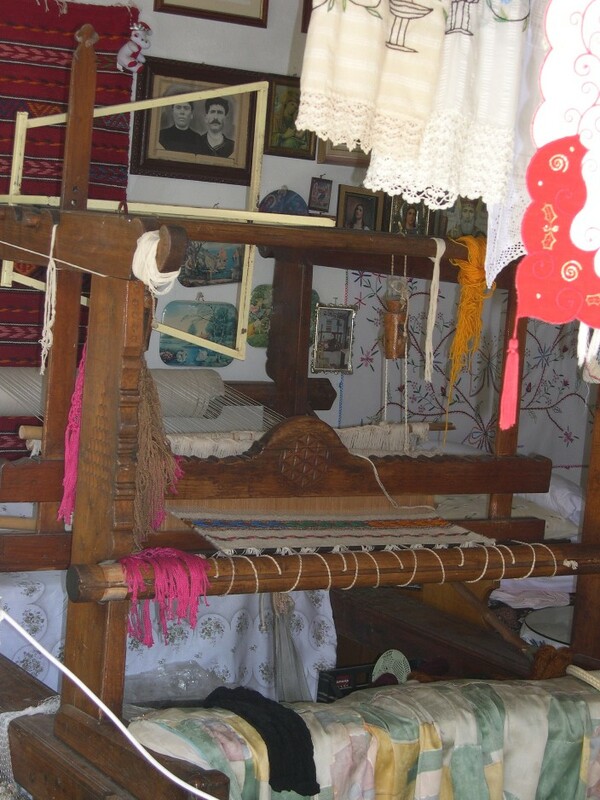 Later, I learned from another weaver that most of the wool in Crete isn't used now. 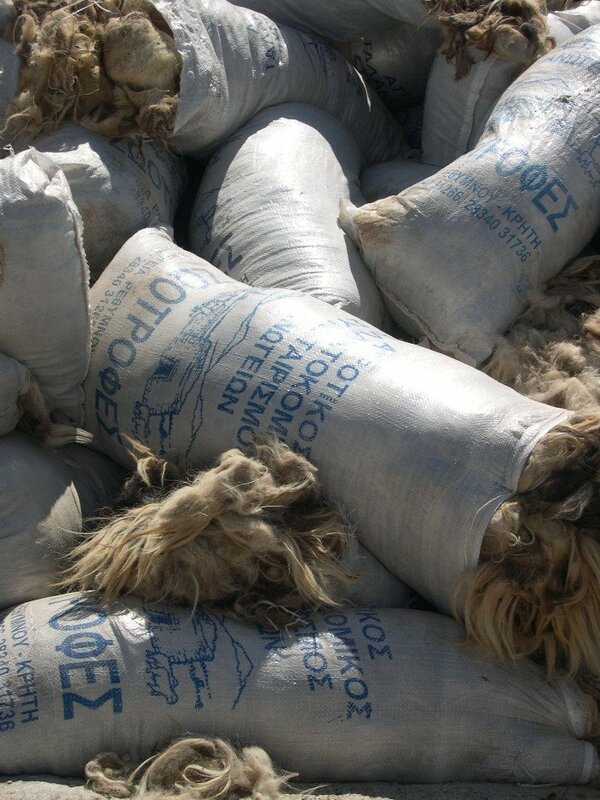 These days it's thrown away after shearing. Sound familiar, American shepherds? 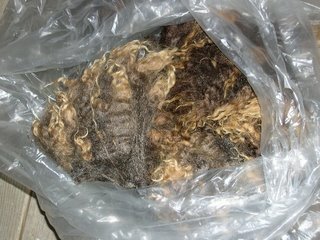 I didn't examine these fleeces carefully--it would be a great way to contract anthrax, I'd guess. However, I did see some lovely handspun yarns later in our trip.